Plantago est genus circa ducentarum parvarum inconspicuarumque specierum plantarum florentium familiae Plantaginacearum. Plurimae sunt plantae herbaceae, sed aliquae sunt suffrutices qui ad 60 cm alti crescunt. Folia sunt sessilia, sed partem angustam prope caulem habent quae est pseudo-petiolus. Eis sunt tres vel quinque venae parallelae quae in latiore folii parte decedunt. Folia sunt lata vel angusta, secundum speciem. Inflorescentiae in pedunculis feruntur, typice 5–40 cm altis, et sunt coni breves vel spicae longae, multis perparvis floribus a vento pollinatis praeditae. Larvae nonnullarum specierum lepidopterorum plantaginibus vescuntur; vide Indicem lepidopterorum quae plantaginibus vescuntur. ↑ "Genus: Plantago L.". Germplasm Resources Information Network. United States Department of Agriculture. 2006-04-20 . ↑ Albach, D. C., Meudt, H. M. & Oxelman, B. 2005. Piecing together the "new" Plantaginaceae. American Journal of Botany 92: 297–315. ↑ Etiam appellata Bougueria nubicola. Cho, Y., J. P. Mower, Y.-L. Qiu, et J. D. Palmer. 2004. Mitochondrial substitution rates are extraodinarily elevated and variable in a genus of flowering plants. Proceedings of the National Academy of Science 101:17741–17746. Dagar, J. C., Y. Kumar, et O. S. Tomar. 2006. 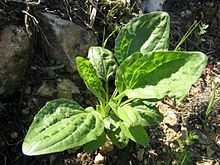 Cultivation of medicinal isabgol (Plantago ovata) in alkali soils in semiarid regions of northern India. Land Degradation and Development 17:275–283. Rahn, K. 1996. A phylogenetic study of the Plantaginaceae. Botanical Journal of the Linnean Society 120:145–198. Rønsted, N., M. W. Chase, D. C. Albach, et M. A. Bello. 2002. Phylogenetic relationships within Plantago (Plantaginaceae): evidence from nuclear ribosomal ITS and plastid TrnL-F sequence data. Botanical Journal of the Linnean Society 139:323–338. Vicimedia Communia plura habent quae ad Plantaginem spectant. Vide Plantago (genus) apud Vicispecies. Novissima mutatio die 19 Ianuarii 2017 hora 19:04 facta.